On Sunday, 25 April, we had dinner with "Breeze" and "Jake". They brought us a bag of peanuts and dried salted rabbit from Jake's girlfriend's mom. Paradoxically, I gave them some BPL mission patches. None of us immediately made use of our gifts. 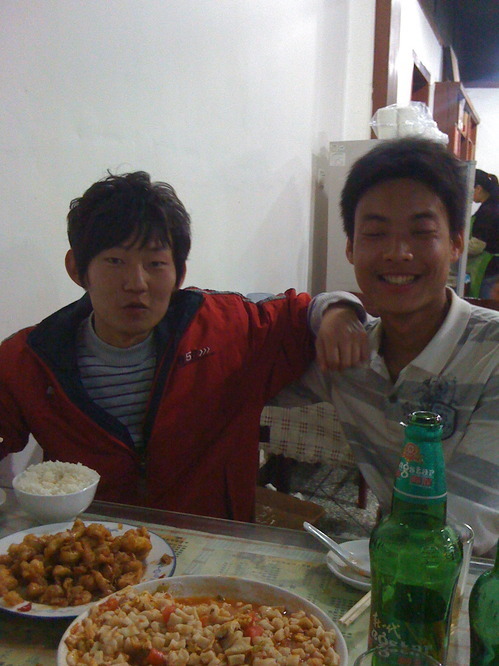 I met these two the last time we came to China. They are 'communications engineering' students, which as a category means something like 'other'. Breeze taught himself English from watching movies. He also taught himself Japanese, and was teaching himself to draw. I have been helping him since then via email with some basic advice for his drawing, and I suppose he is practicing his English on me. When Chinese students learn English, they are given a western name by their teacher. Sometimes people don't really look like a 'Hildebrand' or a 'Coco', but mostly they prefer to use these names with us. I have noticed some of the names change and one Chinese student will have no idea what another's English name might be, even though they are friends. Breeze named himself, which I guess is legal, but I haven't met anyone else that chose the name they had. The last time we came, I was invited to visit Breeze and his friends at their dormitory. The concrete buildings have elaborate facades. However, the entrances and vestibules are unadorned tile lit by a single fluorescent bulb which is on a timer. The rooms look to be about 15 feet square, and around 9 feet high. They have one set of windows and one fluorescent light. The bathroom has a shower with a squat toilet. The bathroom also seems to function as a closet. The two walls adjacent to the window wall are lined with bunk beds. There are six kids to each room. Under two of the bunks are crammed desks, with about two feet of linear space per kid for their study materials and requisite pictures of basketball heros. There is no air conditioning. There are 18,000 students at this university. My appearance in the room was probably a disruption of their studies, but when I came in, each person was playing a video game on a laptop in his two foot domain under the beds. I was told that the foreign teachers never visit students in their dorms, as they are too busy. The students are eager to speak English and practice, and the teachers may be overwhelmed with requests. However, it can probably be easy to forget the conditions the students live in. Unless one is a language major, English classes stop after the second year. Apologizing for their rusty English, they explained that Chinese students may only take classes that pertain to the program for their major- there are no electives. That's why they end up teaching themselves things like Japanese and drawing. One starts to get the sense that these kids have to make decisions early on that are irreversible. I'm happy to let them practice on me while I am here because essentially it's on their dime. This corporate memo issued on: April 28, 2010. Previously issued memo BPL-004, Arrival in Xinzheng. Subequently issued memo BPL-004, Outsourced Worker Progress.